Really, in the Catastraphuk that is the BP oil spill, it actually makes sense. 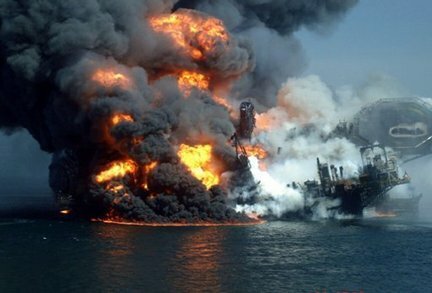 They blow up an oil rig, kill eleven people and dump 4.9 million barrels of oil into the Gulf, and get put in charge of overseeing operations to make sure the oil gets cleaned up…so of course when it comes to possible criminal charges, BP is going to be in charge of collecting evidence to be used against themselves. I’m sure the government wouldn’t have it any other way. Well, not exactly, but they will be closely watched by the Coast Guard, the same organization British Petroleum hasn’t listened to for the past three plus months. “Any items brought up from the seafloor will be photographed and preserved…the blowout preventer will probably make it to the surface. The 300 ton mechanism is designed to be placed on a well and brought back to the surface for reuse. It was supposed to be the final defense against a catastrophic spill, but BP documents obtained by a congressional committee showed the device had a significant hydraulic leak and a dead or low battery. “That piece of equipment will tell us whether the blowout preventer had a design defect or whether it was mechanical or human error that caused this disaster,” said Stephen Herman, a New Orleans lawyer for injured rig workers. Now, why doesn’t that make me feel any better? In an unrelated event, while touring Moscow BP’s Bob Dudley was asked if he ever read any Kafka.